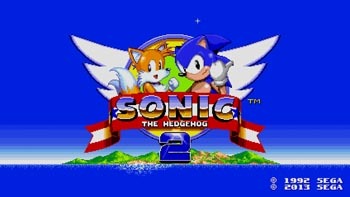 Along with four other Sega games, classic Sonic the Hedgehog 2 is coming to Android for the first time. As a kid on the school bus, each morning I would look out the window and imagine Sonic was racing the other cars on the road. As an adult, now I can both stare out the window of a bus and imagine the blue speed demon while playing one of the first Sonic games on a mobile device. Sega announced this morning that it is bringing five games to mobile devices. Two of those games are Sonic titles. Sonic the Hedgehog 2, a game over two decades old, has run from platform to platform in the side-scrolling game with Sonic and Tails. The iOS version was released in 2010, but the upcoming release is a re-mastered version running at 60 frames per second and higher quality audio. If you had bought the previous iOS version, you can get this version for free. The re-mastered iOS and Android game releases next month. The second Sonic game is a mobile version of Sonic & All-Stars Racing Transformed, a multiplayer action racer. The game will be available for both iOS and Android this winter. Elsewhere, it's been released on the PS3, Xbox 360, Wii U, Vita, 3DS, and PC. Demon Tribe and Rhythm Thief & the Paris Caper are both games for the iPhone, iPad, and iPod Touch to be released in late 2013 and early 2014, respectively. Demon Tribe is a multiplayer online battle arena and card-collecting game in which the player captures demons to build a team and battle others. Rhythm Thief & the Paris Caper is part-rhythmic game and part-investigative game. The fifth game included is GO DANCE, a dancing game for the iPad and iPhone, and it already released on Sept. 12.